Once upon a time, there's a king and queen who lives in the east. They spend their time by playing Gu Zheng, travelling to other countries, drawing and calligraphic. Somehow, they feel that there's something missing in their life. They realise, they wanted a child, whom they can laugh and cry together with. After some time, this pair of king and queen welcome the arrival of their first child, which was a prince. 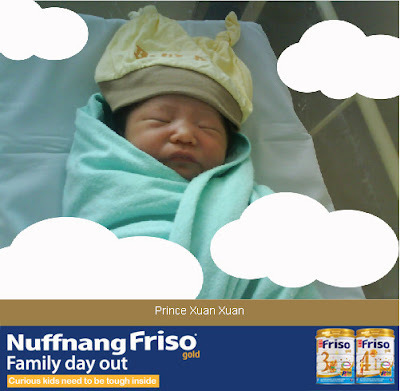 They named him: Prince Xuan Xuan - means bright, talented and prosperous. The king and queen were so happy they celebrated the arrival of their first child with a 3 days and nights celebration. All the people of the eastern kingdom were happily welcoming their first prince which will also be their future king. Somehow, the nightmare had begun. When Prince Xuan Xuan reached 6 month old, he would just cry day and night without stopping. The king and queen were so worried they searched for the best doctor in the whole kingdom to seek for a cure for Prince Xuan Xuan. Oh my! The doctor told both King and Queen that their beloved Prince's immune system is so weak that he's now under the attack of germs and micro organisms. The condition of Prince's is not going to turn better if this continues. The king realise that he has to do something to help his son to grow up and be a strong man. The king will spend most of his days by training Prince Xuan Xuan. From balance diet which contains lots of fruits and vegetables, to daily exercises and work out. The king know that to make his prince become a tougher, stronger child, a strong immune system is a MUST!!! As time goes by, Prince Xuan Xuan becomes more curious and he will climb up and down, rolling, jumping and tumbling every where he goes. He will touch small animals and pick up stones by the road side. 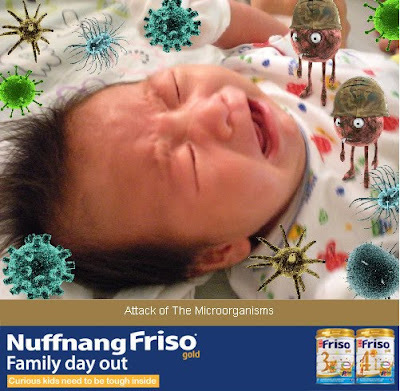 But with all the balance diet and healthy, active lifestyle Prince Xuan Xuan and his parents possessed, Prince Xuan Xuan is able to withstand all the attacks from germs and micro organisms. Prince Xuan Xuan is one of the toughest boy among all the kids at the east. Each and every boy will look up to him as an example, and wish to become as healthy as him with a strong immune system that can fight back all the colds and flu. 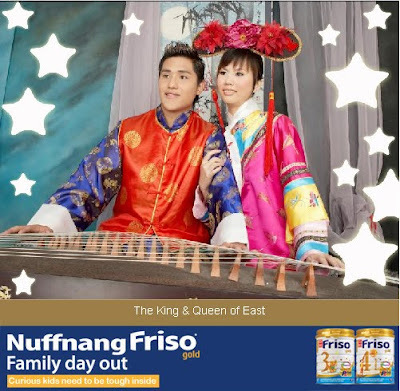 Now, the king and queen are able to let their beloved son explore the world as much as he wants without interrupting him and both of them can have some peace of mind in their life without worrying Prince Xuan Xuan down with colds and flu. They can even have fun when it's snowing in December and wishing all the people: Merry Christmas!!! 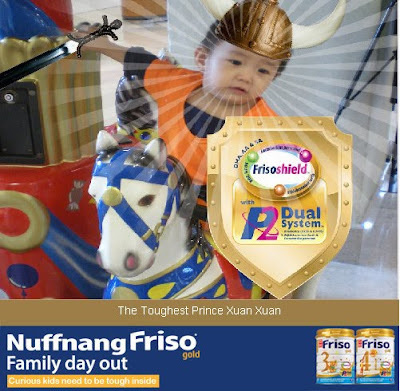 Now, Friso Gold 3 and 4 Growing Up Milk are backed with P2 Dual System™. - GOS, lcFOS and Friendly bacteria - Bifidobacterium lactis to help increase intestinal bifidobacteria and help maintain good intestinal environment. - also contains DHA, AA and SA, essential nutrients that aid a growing child’s overall development. 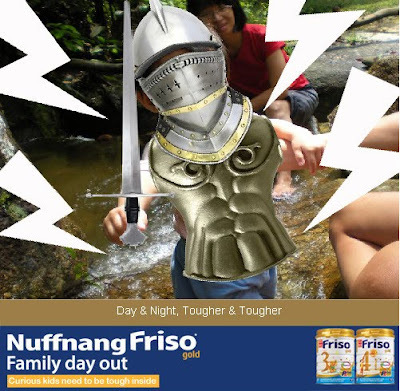 For mothers who are new to Friso Gold, you may want to get your TRIAL PACK HERE! Thank you Nuffnang for organising such a wonderful event for us parent bloggers. Thank you! emm gud luck de join contest ! i can't help laughing while reading..